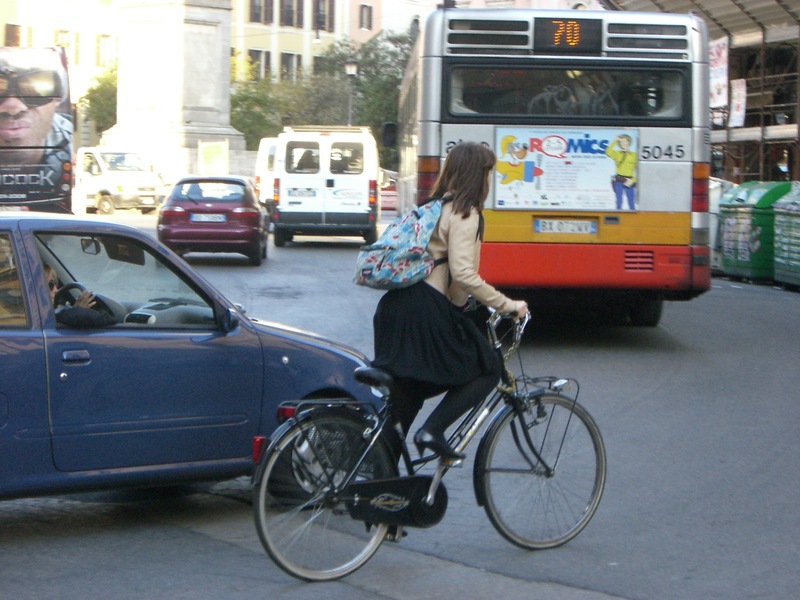 Seen during a trip to Rome in 2008; cycle chic, urban, and in traffic. Occasionally during the seven years that we’ve been publishing Bike Hugger I’d post on the topic of the influence of bikes on fashion. This was usually precipitated by the bike’s re-emergence on fashion runways, in television, movies and in commercials. For reasons that are better left to a sociologist, the bike’s lofty zenith seems to have passed and like Sandra Bullock it’s now headed back to earth at high speed. The bike backlash has been noticed by trend-spotters in the media and several linkbait articles ran this weekend in the New York Times, Times UK, Specator, Deadspin and even on our local TV station. Cyclists are now the attackers of motorists. Pariah that break the law and leave damage behind them. Just like PotofStew did, you can follow the anti-bike sentiment on Twitter or anywhere else people gather online to rant and complain. At the risk of further stoking flamewars, what’s important here is that cyclists have a PR problem and bike-lane people aren’t equipped to handle it. Thanks to the work of social planners we’ve got more bike lanes in this country than ever before but there isn’t the advocacy there to help teach anyone how to interact with a bike. Maybe it’s when bikes got tagged as part of “transportation” or when “cycle chic” articles began to pop up in the press but the core issue is that motorists rule the road and a cyclist doesn’t look, act or feel like a motorist. We are “the other” and we all know how groups react to “others”. Responding to bad PR isn’t the job of the planners and developers that got the bike lanes installed. They’re still celebrating increased bike ridership by setting up bike trip counters so we can admire how awesome we are. With so much hate swirling around us, I want to keep it positive here on Bike Hugger. We’re going to celebrate bikes, not help tear them apart. For more related commentary on this topic, see posts from Seabikeblog, Freebeacon, and this comment from Fredcast. Unfortunately, like many arguments in polarizing debates, this one from NYTimes is too idealistic and unrealistic. Making major and expensive changes to infrastructure takes time, money and will. These are three things in short supply in this country. Besides that, the author’s premise smacks of the same attitude that we see on the roads. It’s as if cyclists are lying on the floor, kicking and screaming, “but these roads are inadequate for ME so I won’t obey the laws. I won’t! I won’t! I won’t” Really? How hard is it to come to a full stop at a stop sign? How difficult is it to stay as far to the right as practicable? Is it really that hard to ride predictably and to signal your intentions? Really? If you want the money to come and the will to change, then invest the time. And the only way this will happen is with a change in attitude and actions. One of our editors, David, started and ran the Rockland Bicycling club in his home county just outside New York City. Every ride the club did started with a safety speech, each one involved single-file riding with hand-signals for turns, full stops at signs and light and no one ever complained about the difficulty in following the rules of the road. The inattentive cyclist endangers only himself. The motorist must be held to a higher standard. It was said by Rod Smith and maybe a marketable slogan.